I don’t really blog about food but when I do, it totally worth to give it a try. For those who know me well, Japanese cuisine is always my number one favourite. Early this year, somewhere in March Raku Pizza just launch their new cafe in Subang SS15. As ex student of Taylorian, Subang SS15 is my favourite hang out spot. I do have a friends who run their cafe in Subang SS15 and SS15 is a well known area for food. The numbers are growing. I heard a lot interesting story about this new pizza concept. This is the latest addition to the area which is inspired by Japan concept and now everyone can have their own style of pizza. I would say I love the decoration. Is just simple yet classic. It’s definitely a good place to grab a bite to satisfied your hunger. Interesting isn’t? Basically, to build your own pizza is rather simple as it is all place in the menu with step by step. Just look at the wall. Step 3: Lastly, choose your own topping and ingredients. Sometimes, your customized pizza can be weird. So, if you are not confident with your own creation, you can choose from their recommendation. Personally, I love the concept. It will be much better if they have Unagi all the time. Based on the price range, I think it really affordable. They have lunch set promotion over the weekdays. Pretty unique concept and worth to give it a try. However, if Pizza is not your kind of meal, you can try other stuff such as Udon and Donburi. Everyone have their own preference and this is definitely place for you to be. Each Pizza only took 3-5 minutes to cook. While waiting for the pizza to arrive, I did try their Takoyaki. I quite like their Takoyaki as its cook to perfection that slightly crips on the crust and soft on the inside. 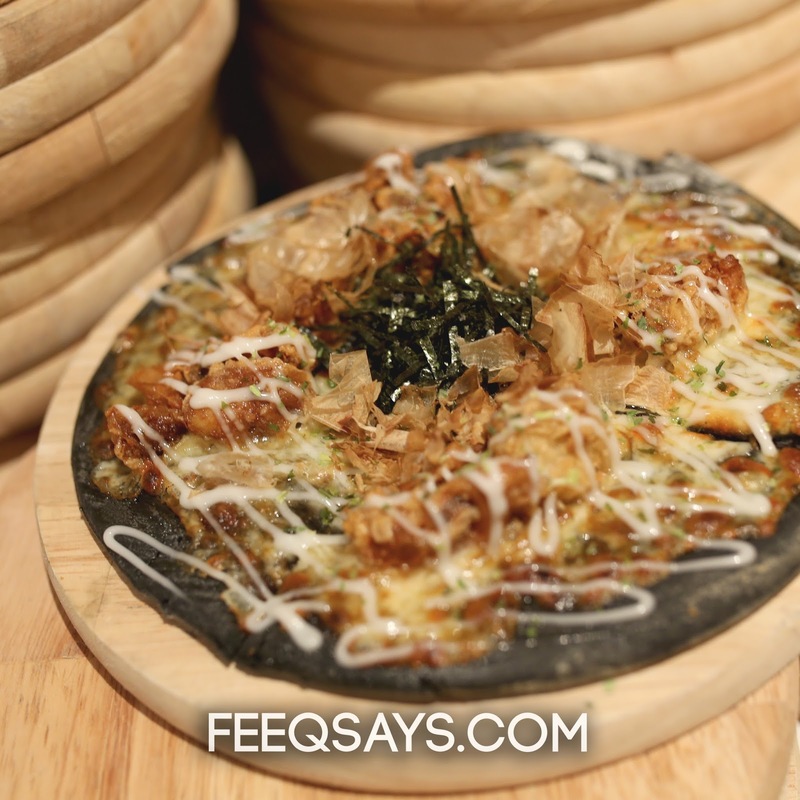 Charcoal crust, Teriyaki Sauce, Cheese, Grill Chicken, Sweet Onions, Onsen Tamago, Japanese Mayo & Shredded Seaweed. This is definitely their masterpiece. One of their best seller and signature dish. What make this pizza is unique? Their runny egg yolk at the centre. The crust is just simply good. Thin and crispy. I find it pretty unique and comes to my liking. Make sure you poke it and spread it evenly throughout the pizza before you eat. Sinful. Charcoal crust, Japanese curry, Teriyaki sauce, Mozzarella cheese, Soft shell crabs, Extra cheese, Onsen Tamago, Mentai Mayo & Shredded Seaweed. This is my creation. If they have Unagi, I’m definitely will replace the soft shell crabs. I think the secret to make tasty pizza is the egg yolk. I really love my creation because it really filling and trust me, one pizza is just enough to satisfied my taste buds. However, I need to ask them to put less Mentai Mayo. Kinda sweet for me. Another creation that I like is this combination. It really filling and I like the combination of shredded seaweed and Bonito flakes. Have you try soft shell crabs on charcoal crust? This is really good. Trust me, if you want to choose type of crust, go for charcoal crust. You won’t regret. Herbs crust, Mozzarella cheese, Japanese curry, Wasabi mayo, Beef pepperoni, Extra cheese & Shredded seaweed. For those who prefer something light you may want try this combination. Herbs crust is something that I don’t recommend if you want to put a lot of topping on it because it will kill the taste of herbs crust. Herbs crust, Japanese curry, Mozzarella cheese, Extra cheese, Shredded seaweed, Pineapples & Grilled chicken. If you like something cheesy yet classic, this is what you are looking for. Make sure you add on Mozzarella cheese and extra cheese. The combination of sweet and sour is just nice. The pineapples and the cheese combination can’t be wrong. Add on some chicken or prawn as topping to complete your pizza. Plain Crust, Teriyaki sauce, Mozzarella cheese, Ebi Katsu, Chicken Ham, Tuna, Crab stick & Extra cheese. Personally, I feel this combination quite weird. I just feel everything went wrong hahaha. Maybe because I’m not a prawn person.